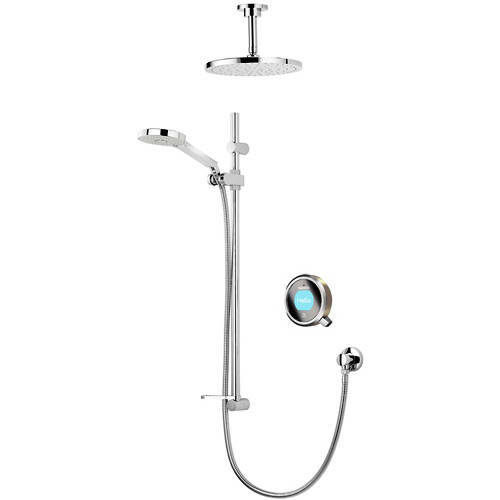 Aqualisa Q > Q Smart 19N With Shower Head, Slide Rail & Nickel Accent (HP). Aqualisa Q Smart digital shower pack 19N for combination boilers and high pressure system (thermostatic). 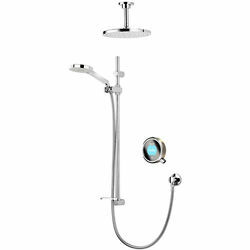 Complete kit with mixer unit, controller, 250mm round shower head, ceiling mounting arm, slide rail kit and metallic nickel accent pack. Q Smart collection (shower pack 19N). Customised: Nickel accent pack included (metallic). Combination boilers and high pressure systems: This smart valve, which is no larger than a shoe box, is for use with high pressure water systems which can include a combination boiler or mains fed water. It can also be teamed with a suitable twin ended booster pump for low pressure systems requiring a powerful boost.